"I always knew I wanted to study journalism, but not many schools have a journalism major that focuses on experiential learning versus theory ... Being able to learn from professors who have first-hand experience and connections within the city continues to help me every day." 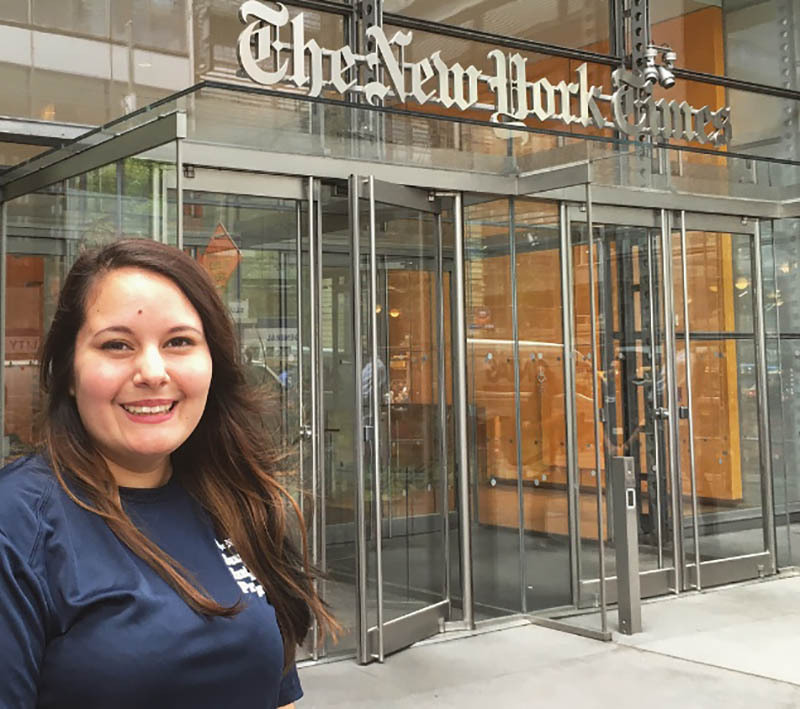 How did you land your internship with The New York Times? For many newsroom internships, you’re looking at the end of October, early November for application deadlines. Through my search for internships to apply to, I found the Dow Jones News Fund, an organization that places students in paid internships at top newsrooms around the country in editing, data journalism and digital journalism. After submitting an online application, my resume and a personal essay, I took an hour-long test, which focused on news judgement, copy editing and current events from the past year. In December, I got a call from The New York Times offering me a summer position and spot in the Temple residency for a week-long program that teaches everything you need for the summer. The program is open to juniors, seniors and graduate students. I highly recommend the program. What were your key responsibilities in this role? Throughout the summer internship, I edited stories on the Culture Desk for clarity, grammar and accuracy. Some stories I worked on included the daily television column, album reviews, television episode recaps and back-reads on daily news stories. What did you learn in this role and how will it enhance the work you do at Point Park? The role of editor takes many forms, and the ability to see how certain editors played with copy was invaluable. As editor of the Point Park News Service, I spent this summer taking in the different styles of editing, writing and leadership. Being able to sit in on different news pitch meetings, I learned the importance of editor-reporter communication. Generating news won’t work if there’s not an understanding of what needs to be accomplished. I always knew I wanted to study journalism, but not many schools have a journalism major that focuses on experiential learning versus theory. After looking at the course catalog and learning that many of the journalism professors here worked in the field and have experience at the outlets in the city, I felt it was the right fit. Being able to learn from professors who have first-hand experience and connections within the city continues to help me every day. Please list internship experiences you've had as a student. Being at Point Park, I have the ability to meet highly focused and dedicated people. You don’t really find anybody who is just part of one activity or group. At Point Park, age doesn’t hold you back, either. Every organization and group is looking for fresh perspectives. What you put into an organization may not be apparent right away, but eventually you’ll see a difference. Take the chance to apply for internships, fellowships and jobs while you’re young. Send those cold emails and applications. There are a lot of people who have never heard of Point Park, and it’s our job to change that by making ourselves visible.